Looking for a heavier footrest? Having feet flat is a crucial component of an ergonomic posture. A footrest can ensure that. While sitting on a chair, keep your knees at 90 degrees, and your feet flat on the floor. A footrest under your desk can keep your feet flat if you cannot rest them on the floor to help you maintain an ergonomic position. Footrests have ergonomic benefits for those who work sitting, standing, or alternate between the two. While standing, stagger step by resting one foot on a footrest, and then swapping your feet every so often. Using a footrest with your standing desk can help with lower back pain by relieving pressure on your spine. The best footrests help improve blood circulation by keeping your legs and back in neutral positions to keep nerves from being pinched. The Workrite 215 footrest is height and angle adjustable, allowing a variety of users to find and maintain an ergonomic position, including petite people who can have much shorter legs. A large 23" x 11" platform provides space to rest both feet comfortably. With 6" to 15" of height range and several degrees of tilt, move the footrest up and down to find the right position, and easily adjust it if you change your shoes, especially if you switch from high heels to flats. This adjustable footrest is a great addition to a variety of offices and workplaces, and its neutral black color means it will fit any interior. Position the footrest under your desk, either in front of your chair or close to where you normally stand. Adjusts along with your movements to correctly support your feet as you move in your seat. Solid construction eliminates bowing that can cause your feet to angle inward. Low profile design minimizes visual impact of FootRester at your workstation. Adjustable height models accommodate greater ranges of chairs and heights. Height Adjustable - Easy height adjustment locks into place automatically. Platform measures 23" wide by 11" deep, can be adjusted from 6" - 15" above the floor in ¾" increments. 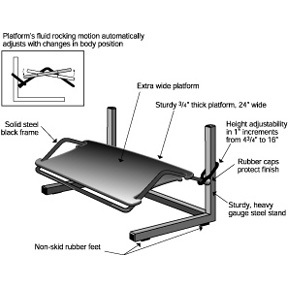 Adjusts as Your Body Does - Platform`s fluid rocking motion automatically adjusts with changes in body position. Non-skid strips available on quotation.